I know what some of you are probably thinking – Kendall Jackson produces a $100 bottle of wine?! Yes they do, and it’s perennially rated and regarded very highly (the current 2004 release is priced at $120, and this 2003 vintage scored between 94 and 98 points by numerous sources). I found it hard to believe myself when I first wandered into KJ’s tasting room in Healdsburg, CA a few years back. The guy behind the counter comped us a reserve tasting, and eventually gave us a pour of this red bordeaux blend. We were all impressed, it was great. I just had to pick up a bottle of this very limitedly produced wine. Well, here I am nearly two years later ready to see how this wine held up, and if it would wow me again. The wine is deep red, nearly purple in the glass with a crimson rim. I popped this bottle open just 20 minutes before heading out to make a dinner reservation and decided to get an early taste of what was to come. The nose revealed classic Napa dark fruit dominated by cherries, floral notes, and a little coco. 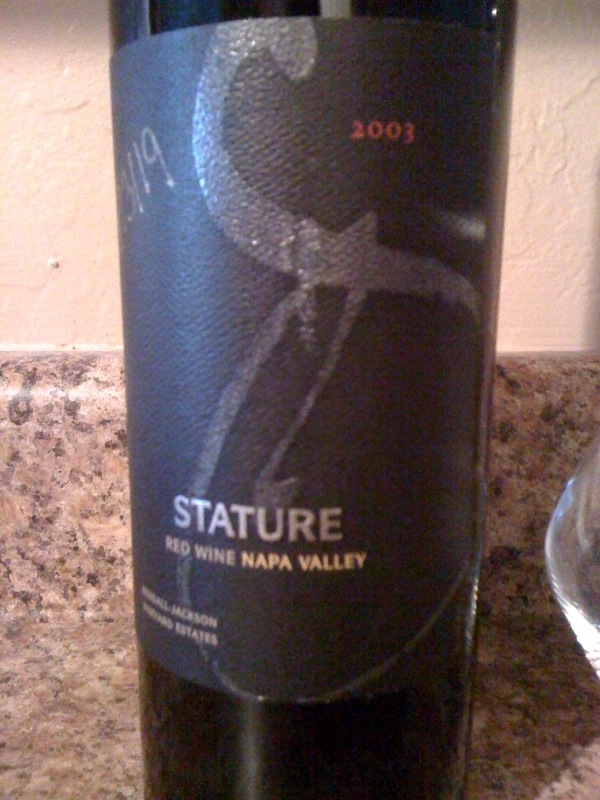 The wine was clearly very tight at first, and offered up complex flavors of cherries, mocha, and spice. After 4 hours in the decanter, the wine was still opening up. Despite a 2003 vintage, this wine is drinking like a baby right now. Without question it could benefit from another 5 to 10 years in the bottle. The nose had not altered much, but the flavors were really starting to reveal themselves now. Gobs of cherries intermingled with mocha/chocolate. Some nice plum fruit was now apparent with a touch of spice. This is a very complex wine with well-balanced tannins and a quite dry, lingering finish. Clearly a bottle you want to open up with a big steak. Overall, a superb wine. I can see why it was rated so high, and much enjoyed when tasted on both occasions. My only complaint would be the overly dry finish. It was more a finish that one would expect out of a Merlot forward blend – not Cabernet. I would also prefer another 2 years of age minimum before opening this particular bottle, but that is hardly the wine’s fault. This wine is a 94 pointer to me. For its incredible complexity and well-balanced tannins, the finish just isn’t there to justify a 95 plus point “classic” rating.